Low Vision? Enhanced Vision has products for Macular Degeneration. Low Vision? We Can Help! 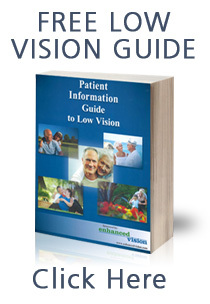 Enhanced Vision understands the challenges experienced when one is diagnosed with low vision. Whether it is Macular Degeneration, Glaucoma, Cataracts, Retinitis Pigmentosa or Diabetic Retinopathy we have a low vision solution. Our extensive line of low vision aids and electronic magnifiers have helped thousands of people regain their visual independence by providing the ability to read, write, see loved ones, or enjoy the outdoors. We are able to achieve these extraordinary results by offering the most diverse and reliable line of low vision aids and electronic magnifiers available. To learn which magnifier might be right for you visit our low vision products page. Vision loss is normal to some degree, especially as people age. Most people who experience a decline in their eyesight are able to correct the problem through the use of glasses, contact lenses or surgical procedures. When routine tasks such as shopping, watching television or recognizing friends and family are difficult even when using corrective devices, a person is described as having low vision. The National Eye Institute (NEI), one of the National Institutes of Health, describes low vision as “the best-corrected visual acuity less than 20/40 in the better-seeing eye.” This means that vision in the better-seeing eye with the strongest correction possible, is worse than 20/40. Treating the underlying cause for low vision with medications, vitamin therapy or surgical procedures may help slow the progression of vision loss, but some sight loss may never be able to be restored. The symptoms of vision loss vary, depending on the root of the problem. Some people who have low vision cannot recognize faces or shapes from a close distance, while others may not be able to see color clearly. Still others who face visual challenges may see the world through a permanent “dimmer switch.” The National Eye Institute has developed a series of questions entitled “What You Should Know About Low Vision,” for people to consider, as a way to help them determine if they are suffering from low vision. Recognizing faces of friends and relatives? Doing things that require you to see well up close, like reading, cooking, sewing, or fixing things around the house? Picking out and matching the color of your clothes? Doing things at work or home because lights seem dimmer than they used to? Reading street and bus signs or the names of stores? Answering “yes” to any of these questions may indicate a case of low vision and should be checked by an eye doctor. Eye care professionals (ophthalmologists – MD/DO and optometrists – OD) can diagnose and treat vision problems and the eye diseases that lead to vision loss. Preventive health care should include a regular eye exam every 2 to 4 years for most age brackets, or more often if required by your ophthalmologist, according to Prevent Blindness America, an eye health and safety organization dedicated to saving sight. Senior citizens over the age of 65 should have their eyes checked every year or two to catch early signs of eye disease. People who feel their vision has changed for the worse should make an appointment as soon as possible, regardless of how many years it has been since their last appointment. Making such an appointment can be a difficult step to take if a person with low vision fears the loss of his independence. However, being proactive can actually help a person with visual challenges take charge of his health and maintain his independence. The more a person learns about her eye disease or other cause of low vision, the more empowered she will be. An experienced eye care professional has a wealth of information about eye diseases, including their prevention and current treatment options. What changes can I expect in my vision? 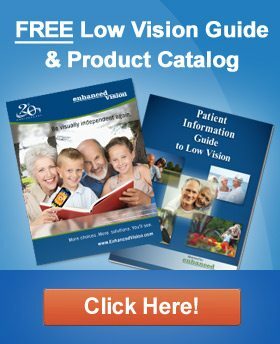 Will my vision loss get worse? How much of my vision will I lose? Will regular eyeglasses improve my vision? What medical/surgical treatments are available for my condition? What can I do to protect or prolong my vision? Will diet, exercise, or other lifestyle changes help? If my vision can’t be corrected, can you refer me to a specialist in low vision? Where can I get a low vision examination and evaluation? Where can I get vision rehabilitation? How can I continue my normal, routine activities? Are there resources to help me in my job? Will any special devices help me with daily activities like reading, sewing, cooking, or fixing things around the house? What training and services are available to help me live better and more safely with low vision? Where can I find individual or group support to cope with my vision loss? Vision Loss does not have to equal the loss of self-sufficiency, and is not a “lost cause.” People with visual challenges can lead as full, happy lives as those with normal vision. People who suffer from low vision are encouraged to remain independent by taking advantage of assistive technologies that are designed for people with visual challenges. Low vision products include reading and video magnifiers, talking clocks and computer software. People with eye conditions may be able to read large print books and magazines more comfortably than traditional-sized print, either alone or with the help of assistive devices. Many people with vision loss will use a combination of several different sight impaired aids to accomplish routine tasks. Mobility specialists and vision rehabilitation services can teach the visually impaired how to adapt a household to accommodate a person with vision impairment, and how to complete everyday events such as going to work, cooking a meal or doing a load of laundry. Those with low vision have access to support and are encouraged to take advantage of their support systems; their families, medical professionals and their local communities may all offer resources and support that can help individuals with vision loss live an empowered, fulfilled life. Read more about low vision, eye health and living with low vision by visiting our low vision information pages. Find out the latest happenings by visiting our low vision blog. ©1997-2019 Enhanced Vision, All rights reserved.